"The Story of Adidon" is a song by American rapper Pusha T. Released on May 29, 2018, the song is a diss track aimed at Canadian rapper Drake. The song samples JAY-Z's "The Story of O.J. ", which was produced by No I.D..
On May 25, 2018, Pusha T released his third studio album Daytona. The album's last track, "Infrared", addressed allegations regarding Drake and ghostwriting. Drake responded by releasing the diss track "Duppy Freestyle" a few hours later. The song garnered significant media attention, as well as a response from Pusha T on Twitter. Pusha T responded to the track by releasing "The Story of Adidon" four days later. In the diss track, Pusha T raps over the instrumental for Jay-Z's 2017 song "The Story of O.J.". Pusha T alleges that the rumor that Drake had a child named Adonis with French model Sophie Brussaux is true, calling Drake a "deadbeat" who is "hiding a child". Pusha T also attacks Drake's alleged insecurities regarding his own race, and mocks OVO Sound record producer 40 for looking frail, which may be due to having multiple sclerosis. The track has been praised for being vicious and harsh. The track was titled "The Story of Adidon" after Drake's rumored upcoming Adidas line, which would've publicly revealed Adonis to the world and use him heavily in promotion and advertising. Adidon is a portmanteau of Adidas and Adonis. The cover features a 2007 photograph taken by David Leyes of Drake in blackface. Though Drake has never responded to the diss track, he has commented on the cover, saying "the photos represented how African Americans were once wrongfully portrayed in entertainment" and how these frustrations hadn't changed since. Upon release, Pitchfork deemed "The Story of Adidon" as Best New Track and later listed the track as the 31st best song of 2018 out of 100. In a June 2018 article, Complex praised the line "You are hiding a child" as the best rap verse of 2018 so far. "The Story of Adidon" was named song of the year by Noisey. Complex listed it fifth in its songs of the year list, The The Tampa Bay Times ranked "The Story of Adidon" at number 10 on their "50 Best Songs of 2018" list, while Pitchfork named it the 31st best song of the year. ^ "The Story of Adidon by Pusha T". SoundCloud. 29 May 2018. Retrieved 29 Jul 2018. ^ Pearce, Sheldon (30 May 2018). ""The Story of Adidon" by Pusha-T Review". Pitchfork. Retrieved 29 Jul 2018. ^ St. Félix, Doreen (1 Jun 2018). "How Pusha T's "The Story of Adidon" Viciously Undercuts Drake's Celebrity". The New Yorker. Retrieved 29 Jul 2018. ^ "Drake Disses Pusha-T and Kanye on New Song "Duppy Freestyle": Listen". Pitchfork. May 25, 2018. Retrieved May 26, 2018. ^ "Drake Hits Back at Pusha T's Diss Track With 'Duppy Freestyle': Listen". Billboard. May 25, 2018. Retrieved May 26, 2018. ^ Doreen St. Félix (1 June 2018). "How Pusha T's "The Story of Adidon" Viciously Undercuts Drake's Celebrity". The New Yorker. Retrieved 28 August 2018. ^ Lars Bandle (31 May 2018). 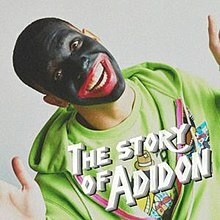 "Drake Opens up on The Blackface Photo Pusha T Used For 'The Story of Adidon' Artwork". Billboard. Retrieved 28 August 2018. ^ Sheldon Pearce (30 May 2018). ""The Story of Adidon" by Pusha-T Review". Retrieved 28 August 2018. ^ "The 100 Best Songs of 2018". Pitchfork. 10 December 2018. Retrieved 10 December 2018. ^ Kiana Fitzgerald; Khal; Shawn Setaro; Frazier Tharpe; Carolyn Bernucca; Angel Diaz (26 June 2018). "Best Rap Verses of 2018 (So Far)". Complex. Retrieved 28 August 2018. ^ "The 100 Best Songs of 2018". Noisey. 6 December 2018. Retrieved 21 December 2018. ^ "The Best Songs of 2018". Complex. 18 December 2018. Retrieved 21 December 2018. ^ Jay Cridlin (27 December 2018). "The 50 best songs of 2018". Tampabay. ^ "The 100 Best Songs of 2018". Pitchfork. 10 December 2018. Retrieved 21 December 2018. This page was last edited on 8 April 2019, at 16:30 (UTC).